How cool is this…. stand up comedy for kids performed at the Famous Spiegeltent at the 2017 Melbourne International Comedy Festival. ABC ME’s Stand and Deliver is hosted by Susie Youssef and features some of the top comedic acts from Australia and overseas. 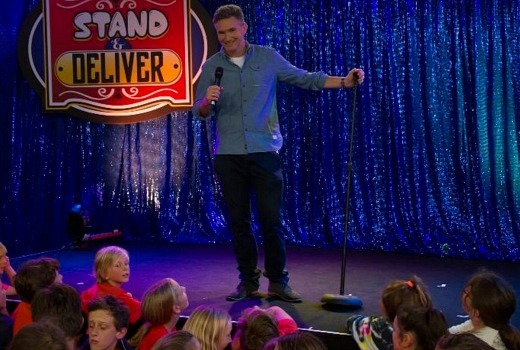 During series two the performances include – the greatest day of Frank Woodley’s life; some side splitting doggie-doodoo tales from Dave Hughes; and an explosive popcorn fight with Aunty Donna, the wackiest, high energy sketchcomedy act around. We also lift the lid on the life of being a comedian with exclusive backstage interviews and see how they cook under pressure in Susie’s 30 second Word Whizz Challenge. Each episode also features superstar kids who tell funny jokes, make their best fart noises, and bring out their silliest faces, just for you! Stand and Deliver is jam packed full of fun, jokes, and all round silliness. You won’t know what hit your funny bone. Host Susie Youssef, Australia’s funniest dad Dave Hughes and drawing extraordinaire Danielle Walker bring some of the funniest and most bizarre animal stories to life in this hilarious kick off episode. Get ready for some huge belly laughs! 5:15pm Tuesday June 13 on ABC ME.